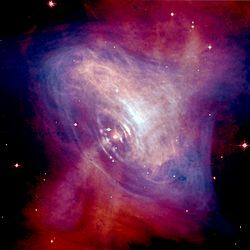 Pulsars are neutron stars which spin rapidly and produce huge electromagnetic radiation along a narrow beam. Neutron stars are very dense, and have short, regular spins. This produces a very precise interval between pulses that range from roughly milliseconds to seconds for an individual pulsar. The pulse can only be seen if the Earth is close enough to the direction of the beam. Similar to how you can only see a lighthouse when the beam is shining at your direction. The first pulsar was discovered in 1967 by Jocelyn Bell Burnell and Antony Hewish of the University of Cambridge. The observed emission had pulses separated by 1.33 seconds, coming from the same place in the sky. The source kept to sidereal time. 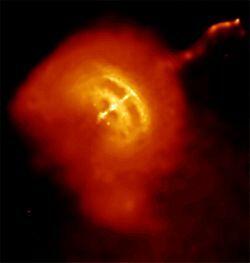 At first, they did not understand why pulsars have a regular change in the strength of radiation. The word pulsar is short for "pulsating star". Pulsar Facts for Kids. Kiddle Encyclopedia.